Bunny Chow, the famous street food of Durban is my next recipe under the theme, explore the counties and cuisines of the southern hemisphere. I was surprised to see the Indian influence in the South African cuisine. During the colonial period, Indian migrants were brought by the Dutch East India Company, and the migrants introduced the spices like coriander, cumin, cloves, cinnamon, cardamom, chilies and also ginger and garlic. 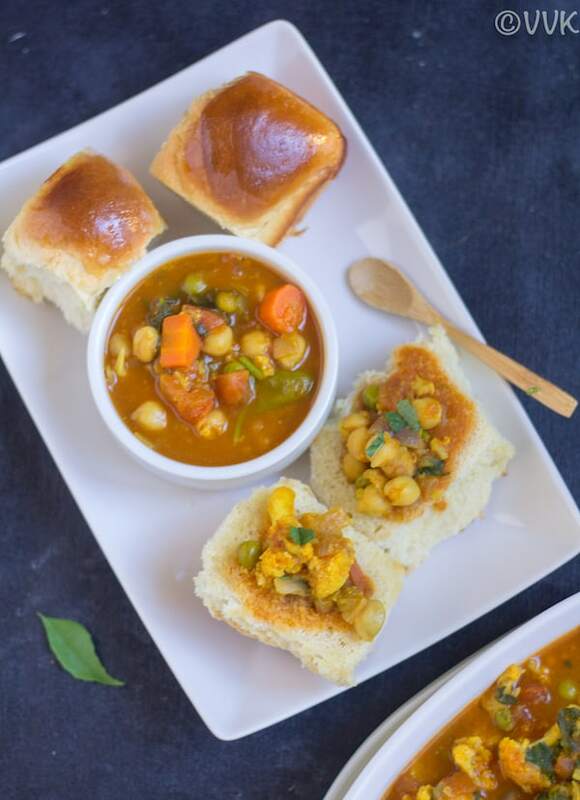 The Indian cooking style slowly evolved, and now you can find a variety of Indian fusion food in South Africa from korma to vindaloo or this bunny chow. 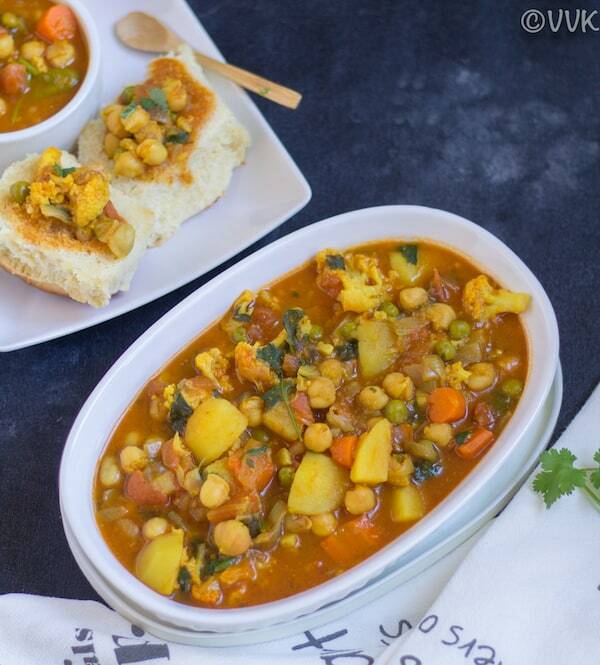 This bunny chow is a combination of channa masala and vegetable curry. You can find this curry served in a hollowed-out loaf more like a bread bowl in Durban. According to the wiki, this bunny chow originated among Indian South Africans of Durban. 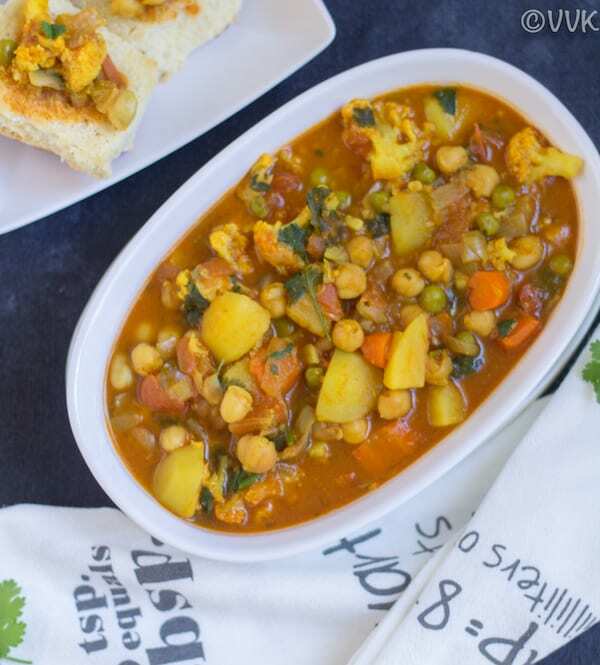 You can find tons of bunny chow recipe on the internet with and without meat and with and without African seasonings. 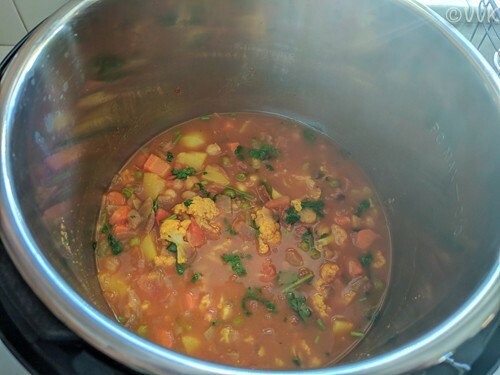 Finally, I decided to make this as a vegan curry with the readily available curry powder. We liked this curry, and we relished it with homemade sweet rolls. 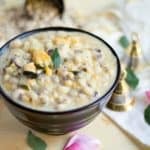 You can serve this with bread or dinner rolls or with any Indian flat-bread. The other surprising factor in this bunny chow is the usage of curry leaves, a quintessential ingredient in the South Indian cooking. All the recipes that I found online called for curry leaves. That’s one of the signature ingredients of this bunny chow. 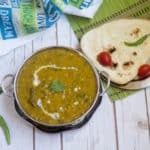 I do need to agree that the curry leaves add magic to this recipe. The power of one sprig of curry leaves (approx 10-12 leaves) is incredible. What if I can’t source curry leaves? You can find curry leaves in local Indian groceries. If you can’t source it, you can ignore it. There is no substitute for curry leaves. I cannot think of any other alternatives for curry leaves. Some may say bay leaf or lime zest, but I am not convinced. 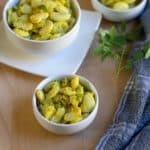 I agree curry leaves add flavor to this recipe, but skipping it doesn’t change the entire flavor profile of this recipe. 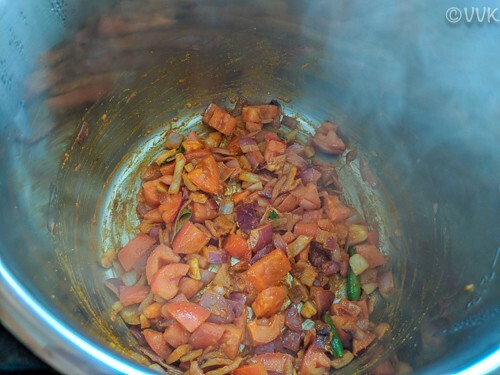 Now without any further ado, here is the Instant Pot bunny chow recipe. Wash the chickpeas and soak it for atleast 6 hours. After 6 hours, drain the water and add it to the Instant Pot. Add 2/3 cup of water and close the lid and make sure the vent is in the sealing position. Pressure cook the chickpeas in “manual” mode for 8 minutes and release the pressure naturally. You can cook the chickpeas well ahead for this recipe. 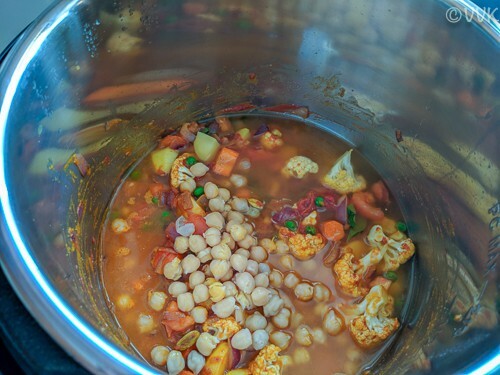 As the cooking time is different for the curry and the chickpeas, I did not combine them. PS: You can cook the chickpeas on the stove-top pressure cooker too. Chop the onion, tomatoes and the veggies. Set the Instant Pot in the saute mode and when the display shows “HOT” add the oil. 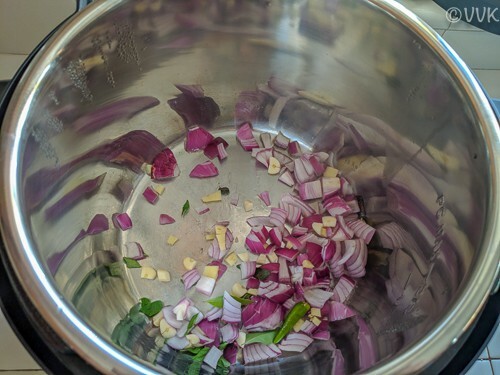 After 30 seconds, add the chopped onion, garlic, ginger, curry leaves, cardamom, cinnamon, and the green chilies. Then add the tomatoes, coriander powder, cumin powder, red chili powder, curry powder, turmeric powder, sugar, and salt. Mix them thoroughly. Now add the veggies and cook for two minutes. Then add the cooked chickpeas, tomato paste and the two cups of water. Mix it and ensure the tomato paste is well combined. Press the cancel button. 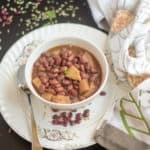 Mix and serve hot with bread or dinner rolls. PS: You can cook the curry on the pressure cooker. 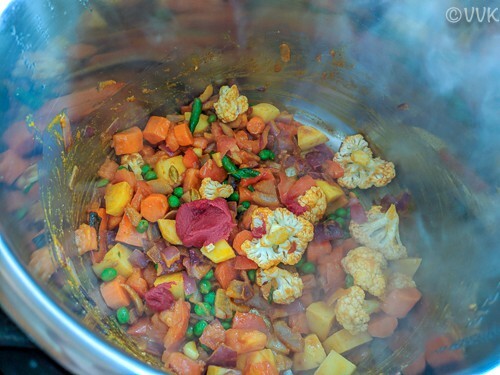 After adding the veggies and water, pressure-cook it for just one whistle. Tomato paste is optional. It adds a tangy flavor and color. Instead of the paste, you can use extra tomato. You need approx — 2 cups of veggies for this recipe. You can mix and match according to your preference. You can cook the chickpeas ahead, or you can use the canned ones too. Bunny Chow - popular street food from Durban, South Africa. 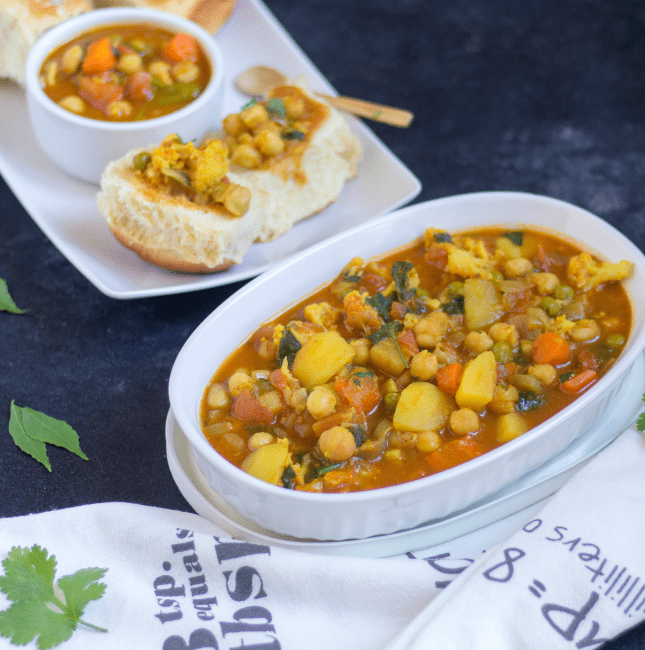 Learn how to make this vegan curry with vegetables and chickpeas in Instant Pot. Pressure cook the chickpeas in "manual" mode for 8 minutes and release the pressure naturally. Set the Instant Pot in the saute mode and when the display shows "HOT" add the oil. Adjust the salt and spices according to your preference. You need approx — 2 cups of veggies for this recipe. You can mix and match according to your preference. You can cook the chickpeas ahead, or you can use the canned ones too. I have been wanting to try out this one for a long time. Your version looks so delicious. You are tempting me too much! That bunny chow is one wholesome and delicious meal, served along with bread. Making the curry in IP must be a time saver right…I enjoyed Bunny chow for one of the Mega BM…I like your different take on this dish! That is an impressive list of ingredients. I totally agree about curry leaves and their distinct flavor profile. With all the veggies and chickpeas this is a filling meal by itself. I remember seeing this on street food video. They serve it in beautiful bread loaf. The combination must taste amazing. oh yeah, that’s how it is traditionally served.Thanks Gayathri. 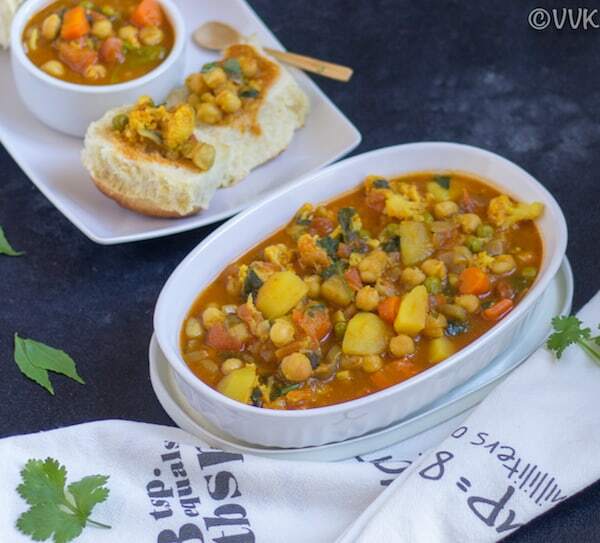 Bunny chow looks wholesome and nutritious on its own way.Totally worth to try na. Well done Vidhya. Agree that there’s no substitute to curry leaves , they have a flavour which no other herb can substitute . The bunny chow is a wholesome meal , and sounds so flavourful . I love such dishes , they might have a long list of ingredients but totally worth it .